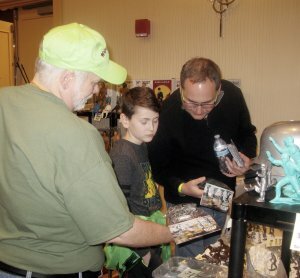 ToyLanta (incorporating JoeLanta, Botlanta and The Great Atlanta Toy Convention) happened March 11-12, 2017. Another highly-anticipated panel featured James Wozniak, the man behind Classic Recasts, who tells the tale of hunting down vintage Marx Toy Company molds, and how that led him to Mexico. That’s James with his back to the camera at right, making a dad and his kid very happy with some great Marx reproductions. James tells us the history of the Guzman family of Mexico and their toy empire and how their patriarch came to rub elbows with the likes of Walt Disney and Louis Marx. He also tells the enthralled crowd how toy molds that were made over half a century ago found their way to Mexico and are still being used to create cool toys. You can find more information about Classic Recasts and James’ work at the Classic Recasts website. Check PopCult regularly because we’ll be posting all the panels we recorded all week long. Next up: Monster Toys!